With a great capacity, 14 programs for washing and 5 for drying, the LG WD14030FD6 combo unit has got your laundry task sorted. If you live in a small apartment, a washer/dryer combo that saves you space is the perfect choice for your laundry needs. Now, this model is not as good as WM3455HW, WM3987HW, or WM3455HS, but still, it’s a LG model – the most popular brand when it comes to home appliances. 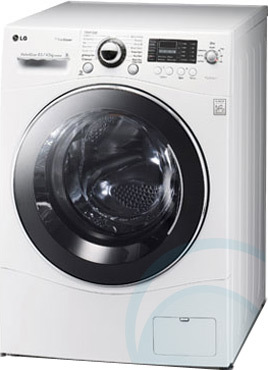 The WD14030FD6 is a highly-efficient unit that has a 4 star energy rating for its washing capabilities, as well as a 4.5 star WELS water rating. 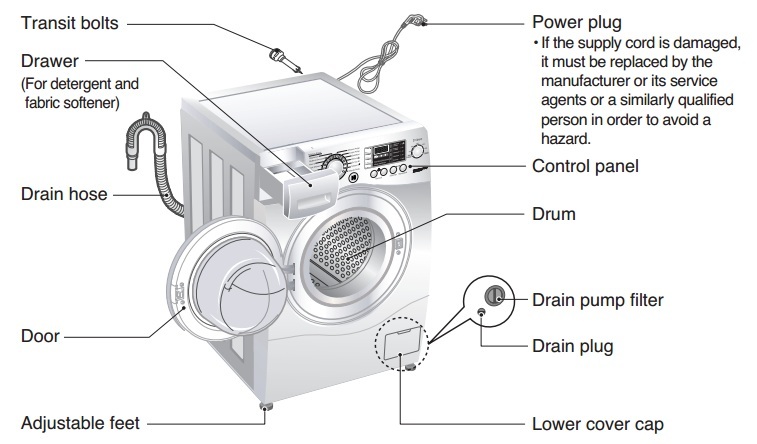 The dryer is a condenser one, meaning you can place this unit everywhere since it doesn’t require ventilation. Direct Drive Motor – gives less vibration and less noise and provides greater durability. Steam Clean – it penetrates deep into the fabric, cleaning all stains. 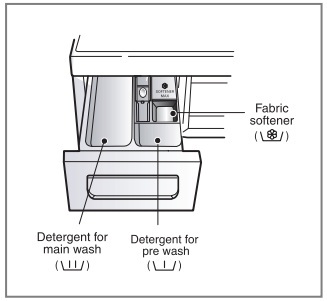 Condensing Dryer – a sealed system that has no discharge of humidity, hear, or lint, and thus, no need for venting. Load Sensing System – the sensors will determine the cycle time and optimum water level according to the load type and size. Variable Spin Speed – No Spin, 400 RPM, 800 RPM, 1000 RPM, 1400 RPM. Variable Temperature – Cold, 30°C, 40°C, 60°C, 95°C. Smart Diagnostic – this technology helps diagnose and solve any problems one might have with their combo quickly and correctly. 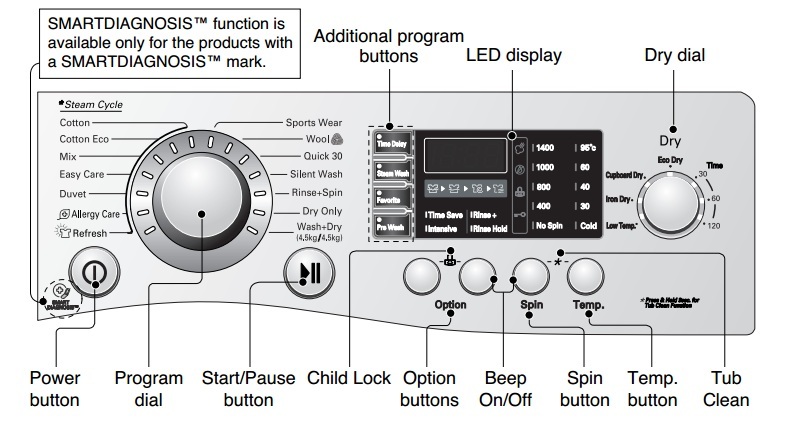 Easy to Use Controls and LED Display – time delay, running time, status and error/self diagnosis. Time Delay – up to 19 hours. 14 Wash Programs and 5 Dry Programs – check the details below. Warranty: 2 years parts and labor; 8 years direct drive motor parts. Wash Programs: Wool, Silent, Quick 30, Cotton, Mix, Cotton Eco, Rinse&Spin, Sports Wear, Divet, Easy Care, Steam Refresh, Allergy Care, Dry Only, Wash&Dry. Materials: Stainless steel washing drum. Unfortunately, I couldn’t find a video related to this LG model. Useful features, like steam wash technology. Different spin speeds and temperature levels to choose from. Saves space, saves time and saves money. The machine shakes during the washing cycle. Capacity for dryer is small. Dryer doesn’t dry the clothes quite well. Conclusion: This LG model uses steam when washing, which not only takes care of the stains and dirt, but it also fluffs up your clothes fibres. Moreover, the WD14030FD6 uses advanced sensor technology which is also a great feature. However, our total score shows that there are better LG models, so make sure you do a thorough research when buying a new combo unit.